This is what I fell in love with only in Black and White. 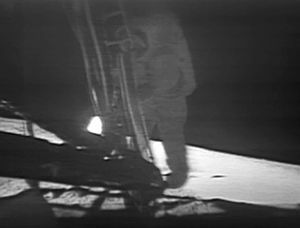 Picture taken 11 minutes after Apollo 11 launched on 16 July 1969. My story about becoming vegan starts really when I was five days from being 6 years old in 1969. 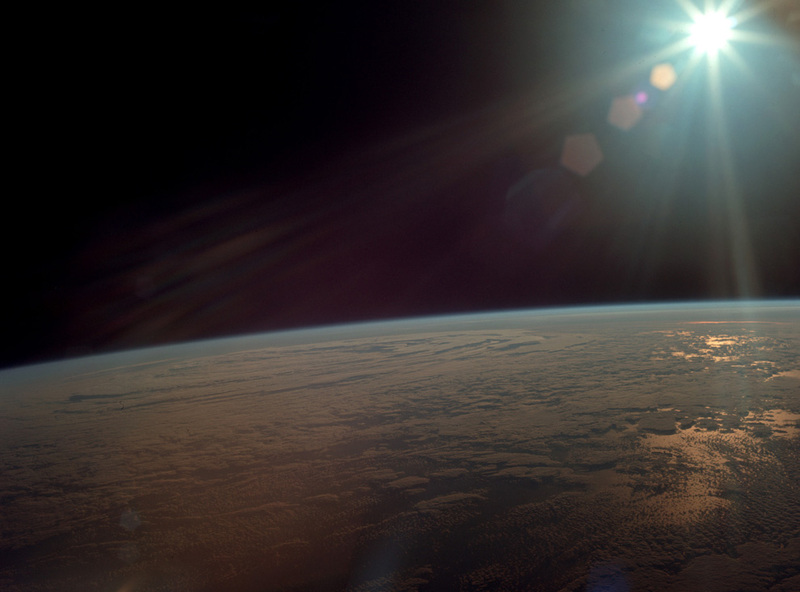 After I watched the moon landing I was moved somewhere deep inside of me when I saw the Earth from space. This is my earliest memory, 20 July 1969. Awesome ~ I was one of the 500 million people who watched this... Wow! Something woke in me and I started seeing the world around me in a different way, especially nature. Even then I didn’t want to eat animals but I was forced to and only when I became an adult and after struggling with the whole meat-culture I turned vegetarian 17 years ago. In June this year I was involved in a facebook campaign against dairy cattle and calf abuse and after learning about it and just how much they suffer, on the 14th June 2011 I decided I could give up dairy once and for all. I am 48 now and only wish I had had the knowledge and understanding years ago, but I was put off by all the negative press and comments about veganism. This was a hard decision to make to be honest as I am a very keen gym bunny and I wasn’t sure how I was going to get all my proteins from plants and become a ‘Vega’ (that’s what I call myself to people). 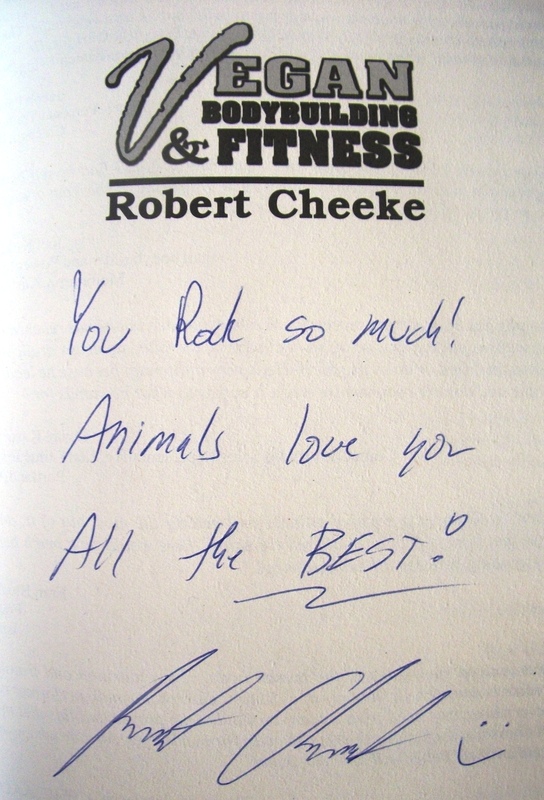 I found an amazing book by Robert Cheeke called Vegan Bodybuilding & Fitness and I have NEVER looked back. 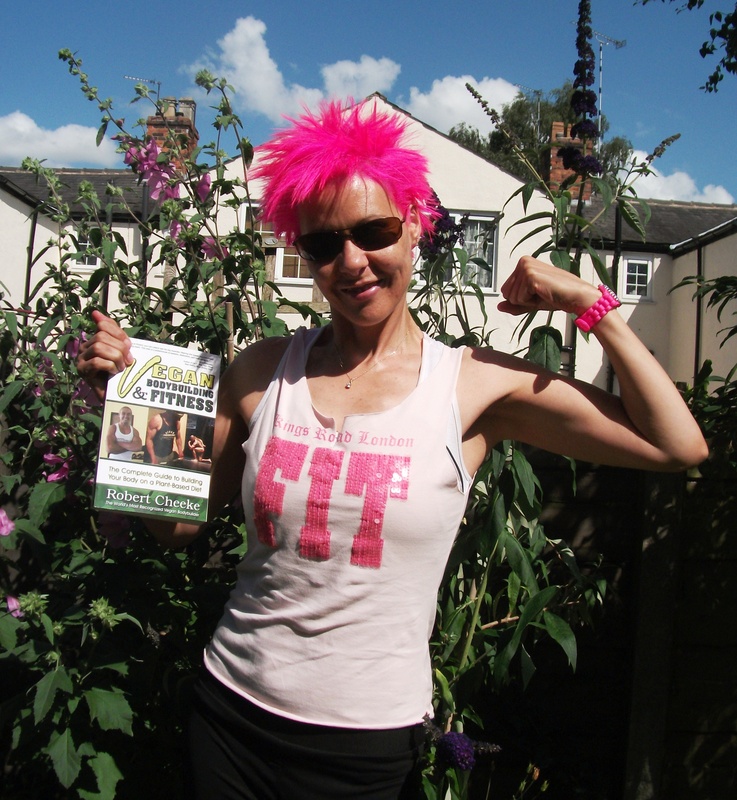 Here’s a picture of me taken in August 2011, I had been vegan for 10 weeks and I think I look fit, well and happy! is, and at all the vegan fairs in the UK they have a vegan bodybuilding show. I do not feel alone and get encouragement from these amazing guys. So, within 2 weeks of being dairy free people started saying how clear my skin had become, and the small spots I had on my chest have all gone! So it appears I was a tad lactose intolerant anyway! What does being a vegan mean to me? I can honestly say that since I have become a vegan my life is better! I have more energy, I am happier as I know that none of my fauna brethren have suffered for me and people tell me I actually glow. I am proud to be a vega and I enjoy educating people about my life-style and positive well-being as a vegan. And what does the future hold? I am currently doing my Masters in Environmental Governance at The University of Manchester in the UK and I am heading for a career at UNEP in post-disaster and post-conflict environmental recovery and I am interested specifically in peacebuilding (http://www.unep.org/disastersandconflicts/), once here I know I can be an advocate for animal welfare and feel that being a vega tells people that I’m serious. Medium term though, I had an interview in April 2011 as a volunteer for next years Olympics here in the UK and I have been accepted as an Olympic Games Maker working in the Technology Team. I have already contacted the organisers to tell them I am a vegan and need vegan trainers. That should make them think! I was also nominated by friends to carry the Olympic Flame when it comes through Manchester in June 2012 and I am through to the final round, I find out in the next few weeks if I am one of 8000 blessed people to carry the Olympic Flame and at that event I hope I get an opportunity to further animal/earth rights. Finally, to anyone whether vegetarian or meat eaters, it is okay to go vegan, yes you have to change your diet which at first is a bit of a challenge, but the benefits will make you feel so awesome. There is so much help out there, for example https://www.vegsoc.org/ who have people who can tell you about a vegan diet. We are in an elite group of people with a heart for animals and the planet and the only advice I would give you is never criticise those who aren’t vegan, we are all on a different journey and yeah… take an iron supplement! Have a very happy Vegan Christmas, and may The Creator bless you and yours. Thanks for your comments. Good advice about the hosting link I will do that. Here’s who I use https://www.4uhosting.co.uk/ and I highly recommend them. Together with everything that appears to be developing throughout this particular subject material, your perspectives are actually fairly exciting. On the other hand, I am sorry, because I do not subscribe to your entire plan, all be it exhilarating none the less. It appears to me that your opinions are generally not completely rationalized and in fact you are generally your self not completely confident of your assertion. In any case I did appreciate reading it. I’m not sure where you are getting your information, however great topic. I must spend a while finding out much more or understanding more. Thank you for fantastic info I used to be on the lookout for this info for my mission. I get my information from my head and then research it. Writing is about creating a chain of thought and expressing it in the hope that at least one person likes it lol. Thanks for your feedback, all the best from the future.